The Mahindra Alturas G4 joins the TUV300, XUV500 among other cars in Mahindra Group - Chairman, Anand Mahindra's garage. Mahindra & Mahindra is known for its utility vehicles and the big boss of the Mahindra Group - Anand Mahindra is known the company creations to his garage from time to time. While his garage boasts some of Mahindra's most recent launches, the M&M Chairman has now added the all-new Mahindra Alturas G4 premium SUV to his garage as well. 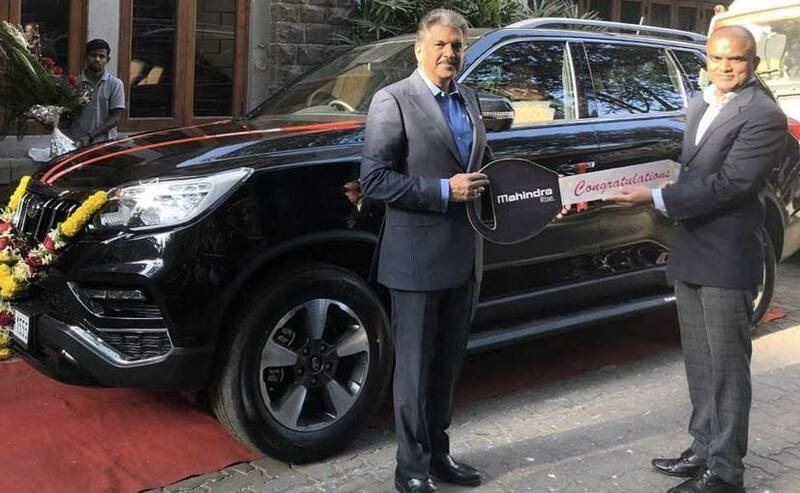 Mr. Mahindra took to social media platform Twitter to share a picture of him and his new "beautiful beast." Prior to the Alturas G4, Mr. Mahindra had added the TUV300 to his collection and took suggestions from his followers for naming his new model. This time too, the christening for the Alturas is yet to happen and suggestions are more than welcome. Two die-cast scale model of Mahindra vehicles are up for grabs as well. The Mahindra Alturas G4 was launched last year and is the new flagship offering from the automaker. The Alturas is a reworked version of the SsangYong Rexton that went on sale globally in 2017. The full-size SUV takes on some very established offerings including the Toyota Fortuner, Ford Endeavour, Volkswagen Tiguan, Skoda Kodiaq and the likes. The Mahindra Alturas G4 is powered by a new 2.2-litre, turbocharged diesel engine, which is tuned for 178 bhp and peak torque of 420 Nm. The oil burner is paired with a 7-speed torque converter automatic transmission sourced from Mercedes-Benz. The Alturas is available in both two-wheel drive and All-Wheel Drive option. With respect to features, the Mahindra Alturas G4 is loaded to the gills and comes with a 360-degree camera system, MID unit, Tyre Pressure Monitoring System (TPMS), ventilated front seats, touchscreen infotainment system with Apple CarPlay and Android Auto, sunroof, HID projector headlamps, 19-inch alloy wheels, dual-zone climate control system and a whole lot more. Safety features are on point too with nine airbags, ABS with EBD, ESP, Anti-rollover protection and ISOFIX seats. Prices for the Mahindra Alturas G4 start at ₹ 26.95 lakh for the 2WD version, while the top-end 4X4 version is priced at ₹ 29.95 lakh (all prices, ex-showroom) for AWD. It's not clear which version has been purchased by Mr. Mahindra.